Passengers are usually taken by train from the port city of Warnemunde to Berlin. In Berlin, step back into the city's turbulent past at the Brandenburg Gate, once closed between East and West Berlin, then reopened in 1989 when the Berlin Wall came down. View the famous sculpture of Queen Nefertiti at the Egyptian Museum, or wander among the shops and cafes of the Kurfurstendamm and Unter den Linden, two of the city's historic boulevards. Tourists staying at port can stroll past the fishermen's cottages on the old Alter Strom harbor. Hamburg to Warnemunde driving directions: Drive 70 miles via highway A20 until exit number 14. Follow the state road B103 for 12 miles until you arrive in Warnemunde. 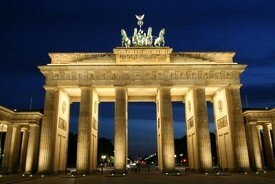 Berlin to Warnemunde driving directions: Drive 110 miles via highway A19 and take exit B105 to Warnemunde. Drive another 3 miles until exit B103/Rostock-Nord and you'll arrive in Warnemunde.